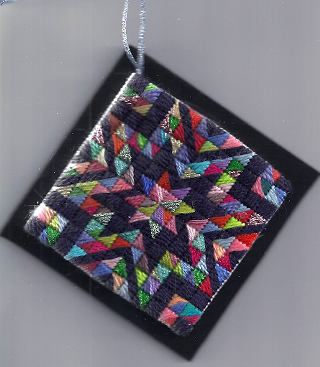 This month’s Scrap Bag Needlepoint ™ uses a contemporary quilt block as the basis for an Amish-style ornament. Two aspects of the design make it a needlepoint version of an Amish quilt. First the colors range from green through red; there is no orange, white, or yellow. In the most traditional Amish communities you won’t find orange, yellow or white in clothing. That’s because those colors are associated with mourning. Because quilts are usually made from scraps from clothes making or discarded garments, you won’t find these colors in quilts either. Second, the black background makes it feel Amish. Let’s think about Amish clothes once again. Men and boys wear black pants, black vests and brightly-colored shirts. Women and girls wear black aprons and bonnets over brightly-colored dresses. So black cloth is always a part of Amish sewing. While black isn’t constantly used in quilts, it is still common. If you want your design to have a strong Amish feel, use these colors on black, as is the case here. Because the background is black, darker canvases will work better because any canvas that shows through will be less noticeable. Black canvas can be very hard to see. Dark blue or dark green canvas is much easier to see and works almost as well. 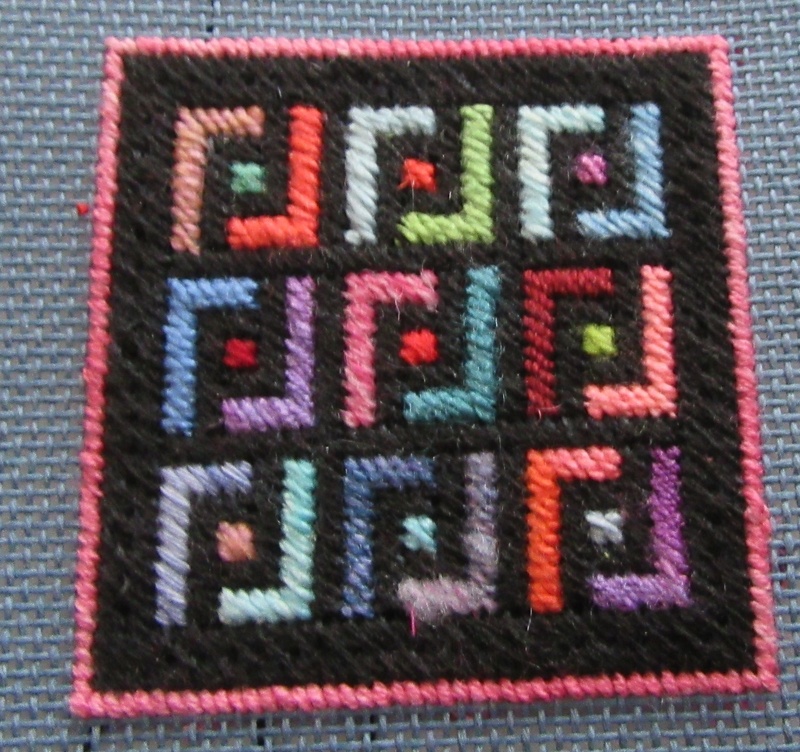 The basic block of this design has a Mosaic Stitch in the center of each block. This is surrounded by right angles in Gobelin Stitch. The inner ones are black while the outer ones are in colors. One of these blocks is charted below. There are nine in the project. Each block is separated from its neighbors by two threads. After all the blocks are stitched these threads are covered in Diagonal Gobelin, below, using the black thread. After the center of the quilt is stitched, it is surrounded by a border of Cocktail, below, using the black thread. Once you have stitched the main part of the quilt you want to add the final bit of color, in this case pink. In a real quilt this is the binding which holds all the layers of the quilt together and finishes the edges. Although the binding can be the same color as the background, in Amish quilts the binding is seen as a chance to add more color. You can use as your binding a color you have used in the quilt, a similar color, or a color you have not used before. The binding is a border of one Tent Stitch. Cut 4″ of pearl cotton and knot ends to make the hanger. Trim the ornament with about a five-thread margin of unworked canvas. Fold these edges to the back of the canvas. Cur out black Fun Foam 1/4″ bigger than the ornament all around (or about 3″ square). Place a dot of glue about ½” from a corner of the foam and put the knot of the hanger on it on it. Place glue along the edges and in a cross through the center of the needlepoint on the back. Press it onto the foam about ¼” from the corner, making sure it is even placed along the two edges of the foam. Weigh it down and let dry for 2 hours. Once dry, trim the foam so that the margin of foam is even all around, if needed. Come back on March 28 for another great Scrap Bag project!